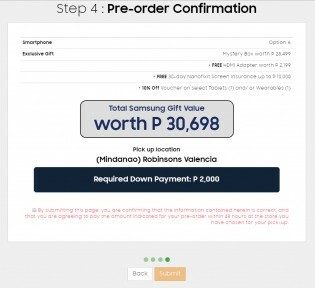 Observant redditors spotted a curious “early pre-order” on Samsung Philippines. 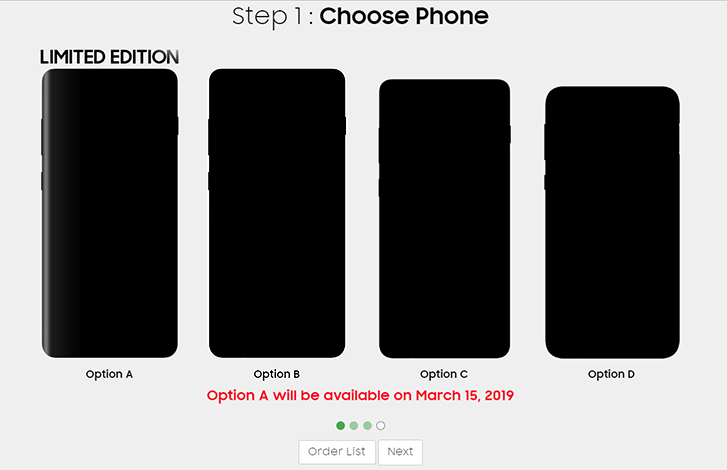 What’s curious about it is that you’re not told what you’re getting, instead you can pick from Options A through D.
Still, Option A has a “Limited Edition” label above it that quite literally shines to grab your attention. And as soon as you click it, a red text tells you that this option will be available on March 15. What else is happening in March in Galaxy-land? Not much – other than the launch of the Galaxy S10 series. Option A comes with an “exclusive” gift package worth a total of PHP 30,698 – that’s $588/€520 – and requires a downpayment of PHP 2,000. The package includes a “Mystery Box”, free HDMI adapter, Nanofixit Screen Insurance and a 10% off voucher for select tablets and wearables. That’s a significant chunk of the price of the Galaxy S10 phones, which range from the S10e’s €750 to S10+’s €1,000 (these are the European prices of the base models). Seeing how Samsung left the curved screen visible as a clue, this is either the Galaxy S10 or Galaxy S10+ (the S10e has a flat screen). Chances are that this is a Plus model as it’s the premium version, more worthy of a limited edition release.